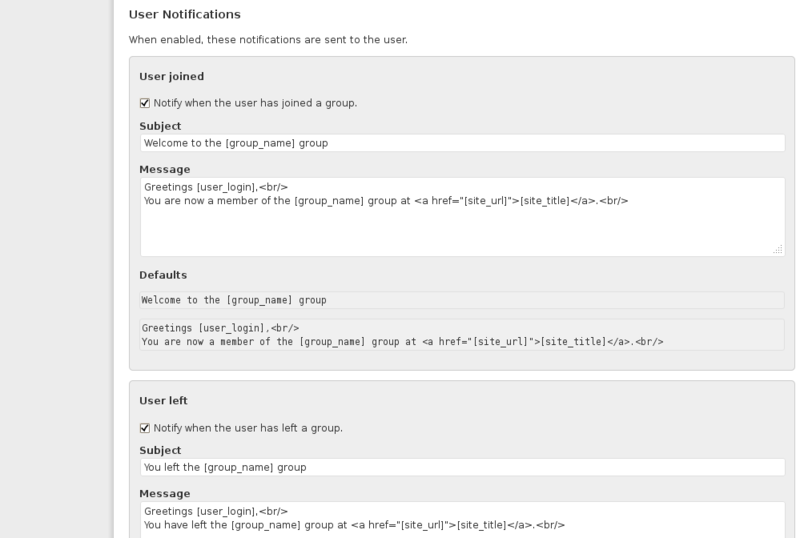 Download the free Groups Notifications WordPress plugin. The plugin adds a Notifications menu item to the Groups menu where the notification settings can be adjusted as desired. All notifications are turned off by default and must be enabled individually. Each notification allows to set a customized subject and message text in HTML format. More details on the settings are explained in the Documentation. Groups can be installed from your WordPress dashboard and the latest version is also available on WordPress. thank you so much for your suggestion. We’ll have a look. As it was already mentioned earlier, I’m a bit disappointed we aren’t able to setup notifications on a group-level base. We’d like to send a simple confirmation to users who join a specific group. Would there be a way to filter out the send mail function for only a particular group ID? maybe this more simple plugin can help you. Hello Antonio and thank you for the link! I managed to add a small line to exclude all groups but one with Groups Notification since we only wanted to have notifications enabled for a specific group so it does the trick for now but I’ll eventually dig into the plugin you linked since it seems a bit more future-proof. I post several articles per week and I use a plugin that is post notification that everyone received an e-mail with the content of the post. But I would like to send only to the members of certain group and like this, everyone registered receive the post. please have a look to the Groups Newsletters plugin. So now I use two additional tokens: [group_description] and [user_name]. Is there a way to display Group Description instead of Group Name within email message? I just installed and configured this plugin today and was disappointed to see that notifications cannot be sent to an individual group. This type of functionality would be extremely useful to my project. Is there any guidance you could offer to me in modifying some code to make this work? I only have 1 group outside of the default “Registered” group and simply desire to send a notification message to those that join this group via a product purchase using the Groups for WooCommerce plugin. Wouldn’t it be simpler to just include a product-specific message? WooCommerce already allows you to do that. I wasn’t aware that WooCommerce allowed for product specific messages. Any pointers on where to start with that? I haven’t been able to find anything about WooCommerce product specific message in my searching. If you want to use Groups for that, I’m using the notifications add on and it could be set up to do just that. I can’t find a way to change the on-screen confirmation text “You have joined the X group”. Can you advise how I would make this change? I’m using this feature for my own admin notification and the user is not “joining a group”. you can create your own translation files in groups/languages. I found another thing that I’m sure a lot of people will find very useful, that would be a way to test the emails you format. You have a way to test the default and the SMTP settings, but that test email is just as test email and it’s not a preview of your emails that you formatted, you need to technically join a group to test that. So, maybe it would be a good idea to add a feature like that. Again, hope I don’t come across as asking or requesting that you do this now or in the future, I’m just suggesting. Thanks for the suggestion, although I think it would be a low priority feature, we can still add it as a feature suggestion. 1. Create a group named “Test”. 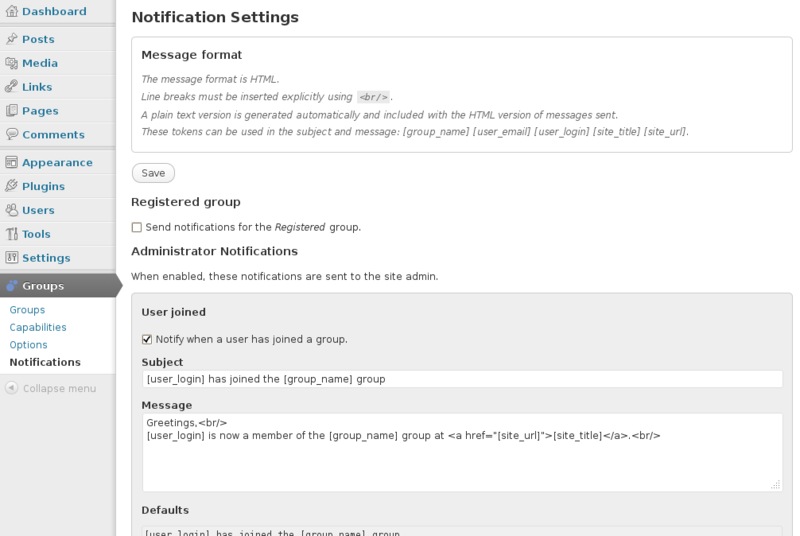 With notifications enabled, messages and SMTP settings configured under Groups > Notifications, try it out by joining and leaving the Test group using the buttons. Thank you very much for your awesome contribution with this plugin. Just had a question: Any chance that I’m missing something on how I could make this plugin work only for a specific group and not all my groups? Many thanks for the kudos 🙂 That’s a good idea, it isn’t possible to exclude any groups as it is currently, but that would be a great option to have. This should be added to the plugin. Hey Kento, that would be awesome… I’ll keep an eye out for a new release that might include that, right now I have no other option but to tell the client it’s not a feature I can provide at the moment, he will surely understand as I never confirmed it would work. Thanks again, all the best, cheers! I have a problem since ~2 months with this plugin : every time, all settings a reseted by default. Do you any idea why ? Do you have any other plugins that can eliminate options from the wp_options table? The plugin itself doesn’t reset its options by itself so that would be the first thing to check. I have to check but do you have a technic to track this please ? I have installed the plugin CloudFlare, do you think it is related ? It shouldn’t be related but try disabling caching on the admin side, go to Groups > Notifications, check your settings and save. Then visit the page again to make sure that your changes have been recorded. I just installed groups notifications, but i do not get noticed when a user is assigned to a group by using the [groups_join group="X"] button/short code. I checked: Send notifications for the Registered group and Notify when a user has joined a group. The test mail works and arrives. Also the user is assigned to the group without problems. But i get no notification mail when this user is assigned to the group…What could be the case? If the test email works but the notifications don’t, it might be because the notification emails end up in the spam/junk folder. That’s the first thing I would check, otherwise there might be an issue related to the versions you are using – make sure to use the latest version of the Groups plugin. I hope that helps, let me know otherwise please. I am planning on purchasing your Groups Integration for WooCommerce and installing it with Groups Notifications. Does the Groups Notifications plugin have the ability to let users know there group membership is going to expire in a certain time period (e.g. : a plain text email is sent saying your group membership will expire in two weeks), to give them one last chance to purchase an item and reactivate there group membership. Love the plugin – just installed it today and am loving what I see so far. Am confused though, when d/l through WordPress – the ver. is 1.3.6, on the website 1.0.1. The version on the website (here) seems to have the Notifications feature which the installed version does not? Which version is the latest? Thanks for your support, time and energy! The code on the page is shown below. What am I doing wrong? Hi RevKev, these are two different plugins, the higher version is that of the Groups plugin and 1.0.1 is that of the Groups Notifications extension. Regarding your code (which looks ok) and the buttons, the button to leave a group would only be displayed when the user is a member of a group.